Edited by Gabriela Rangel. Texts by Alexander Alberro, Nuit Banai, Mariela Brazón Hernández, Estrellita Brodsky, Ariel Jiménez, Isabela Villanueva. One of the finest exponents of Latin American Kinetic and Op art, the Venezuelan artist Carlos Cruz-Diez (born in 1923) is a legend among contemporaries such as Jesus Soto and Alejandro Otero—and across Latin America and Europe—but has been woefully little exhibited in North America. Those who caught the groundbreaking 2007 traveling exhibition The Geometry of Hope will recall Cruz-Diez's standout contributions, which had viewers bumping into one another as they negotiated the color shifts and sensations of motion that his sculptural constructions induced. A pioneer in color theory and color perception, Cruz-Diez solicits physical participation in his audience. 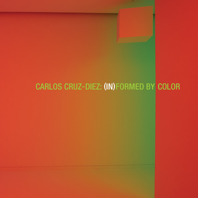 In late 2008, the Americas Society, known for its leading role in presenting innovative site installations by artists such as Gego, Lygia Pape and Pedro Reyes, orchestrated Cruz-Diez's first solo exhibition in the United States, for which Carlos Cruz Diez: InFormed by Color is the exhibition catalogue—the first comprehensive publication in English devoted to the artist.